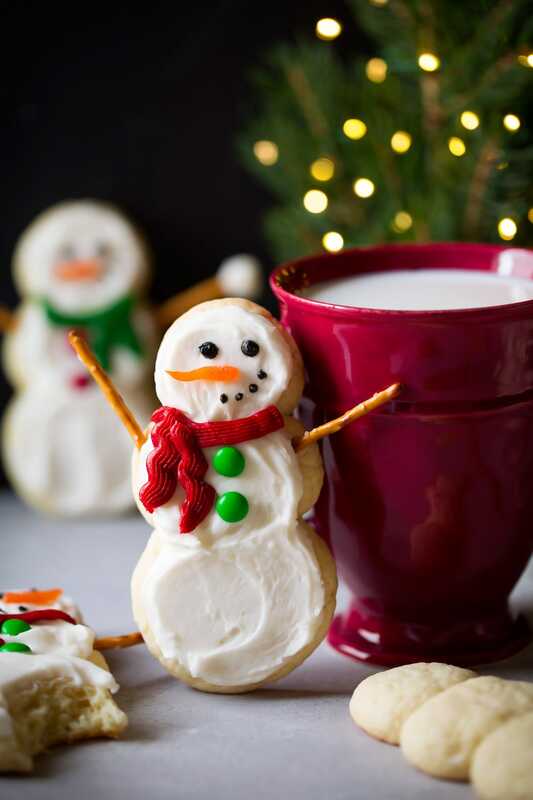 Snowman Sugar Cookies have a melt-in-your mouth softness like the Lofthouse sugar cookies, yet they taste a thousand times better! 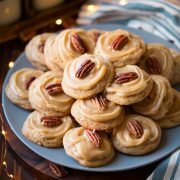 You’ll be savoring them down to the last crumb, simply put they are one dreamy holiday cookie. 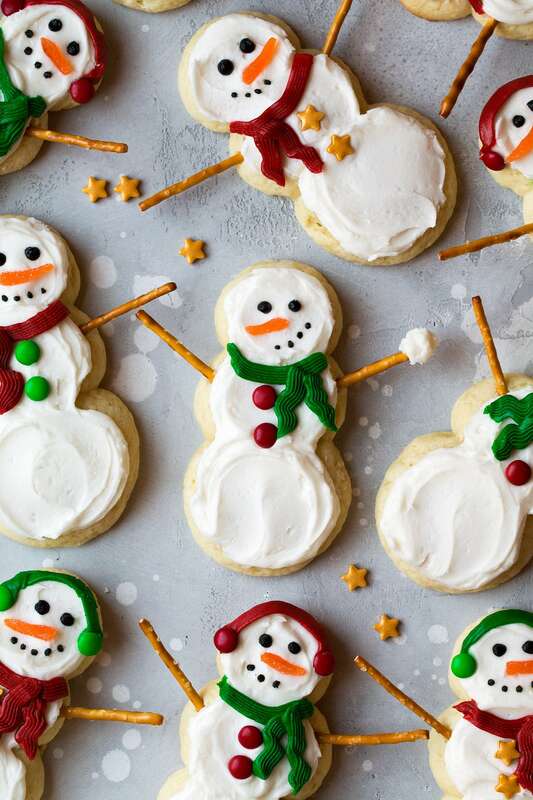 Like I mentioned in an earlier post about these, these Sugar Cookies would definitely make the cut for my list of top 5 favorite Christmas cookies! I love their perfectly soft and tender crumb – thanks to the cornstarch and sour cream. 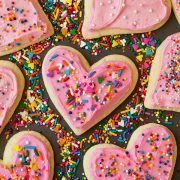 I love their flavor – which is a buttery cookie with hints of depth thanks to the sour cream, then the almond and vanilla extract add some decadence. I love their sweet and creamy vanilla frosting. And obviously I’m loving their cute and festive look. They’re just too fun. Prep cookie dough and chill. Shape dough into rounds of 3 descending sizes. Bake until set. Let cool on wire rack. 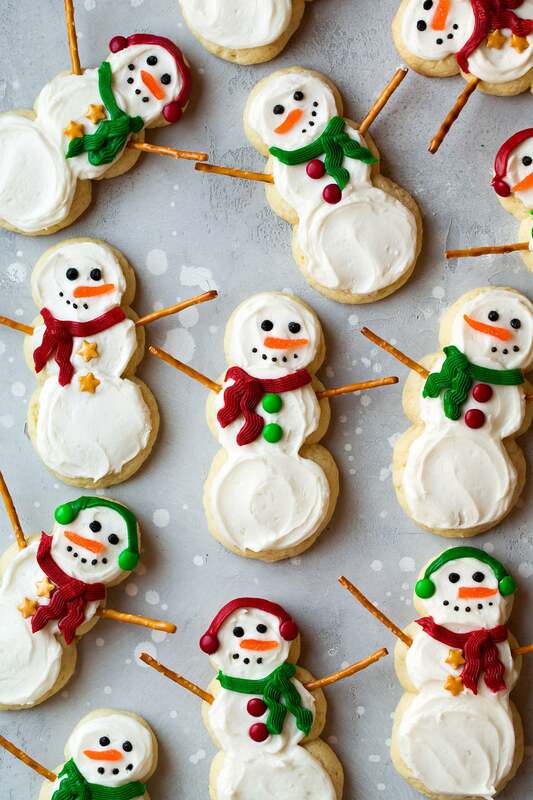 Prepare frosting then frost cookies. 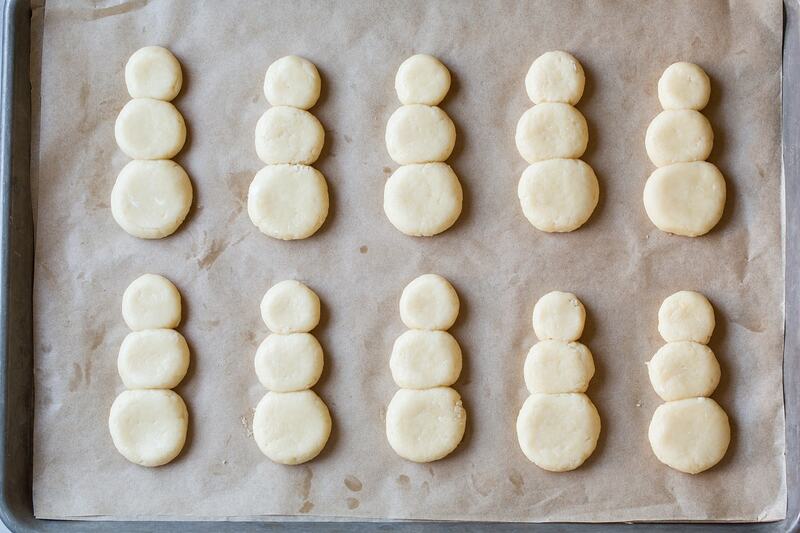 The method I used here doesn’t require a cookie cutter – though a snowman cookie cutter without a hat should work as well. They won’t keep detail with a cookie cutter, though that shouldn’t be a problem since they’re just rounds. If going that route roll between 1/2 and 1/4 inch thick on a floured surface and be careful when transferring. 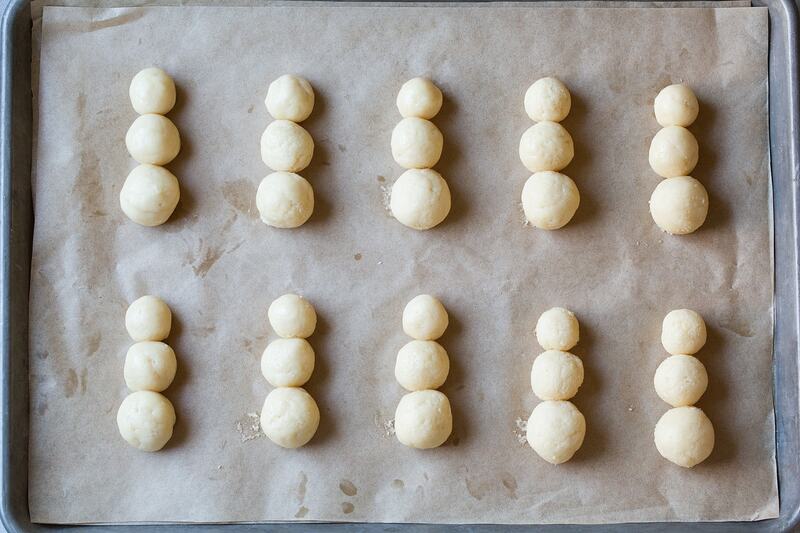 I won’t lie it is time consuming rolling out all the various shapes of dough balls but it’s the perfect weekend project. And if you like consistency like me go for the kitchen scale – it’s actually probably the faster method. My kids loved decorating these. And of course I did too! If you want more detail transfer store-bought icing to piping bags with tiny round tips. Then here I used super thin pretzel sticks for twiggy-like arms but just use what you can find. I hope you have a few relaxed hours this weekend that you can make a batch of these cookies. They may take some time but the end result is so worth it. 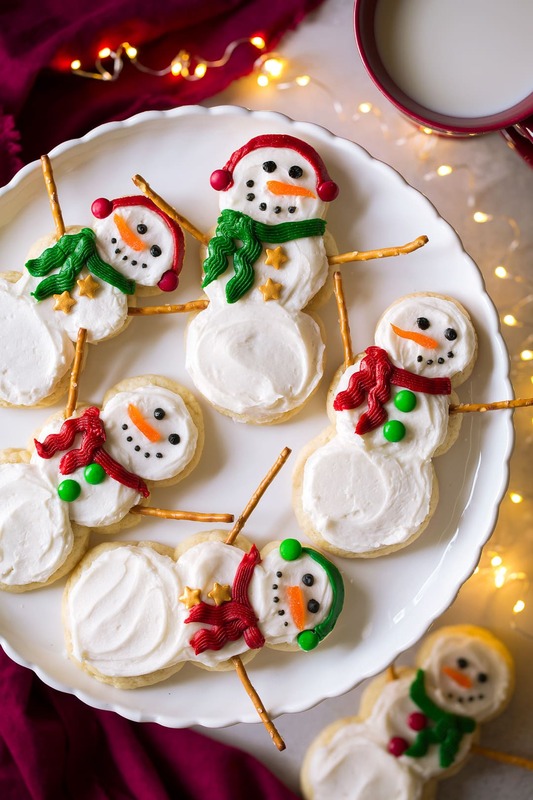 Both kids and adults are obsessed with these cute and oh-so-tasty snowman cookies! One of the best Christmas cookies I've had! Fun to make, so delicious and just too cute. They would be the perfect gift to give this year. In a large mixing bowl whisk together flour, cornstarch, baking powder baking soda and salt for 20 seconds, set aside. In the bowl of an electric stand mixer fitted with the paddle attachment cream together butter and sugar until blended. Mix in egg then blend in sour cream, vanilla extract and almond extract. With mixer set on low speed slowly add in flour mixture and mix until combined. Cover bowl and chill until firm enough to roll, about 2 hours. Preheat oven to 350 degrees during last 10 minutes of chilling. Line two baking sheets with silicone baking mats or parchment paper. Remove half of the dough from refrigerator. Shape dough into 9 (1 1/4-inch, 20g) balls, 9 (1-inch, 14g) balls and 9 (3/4-inch, 9g) balls (spray hands with non-stick cooking spray if needed if dough is slightly sticky). 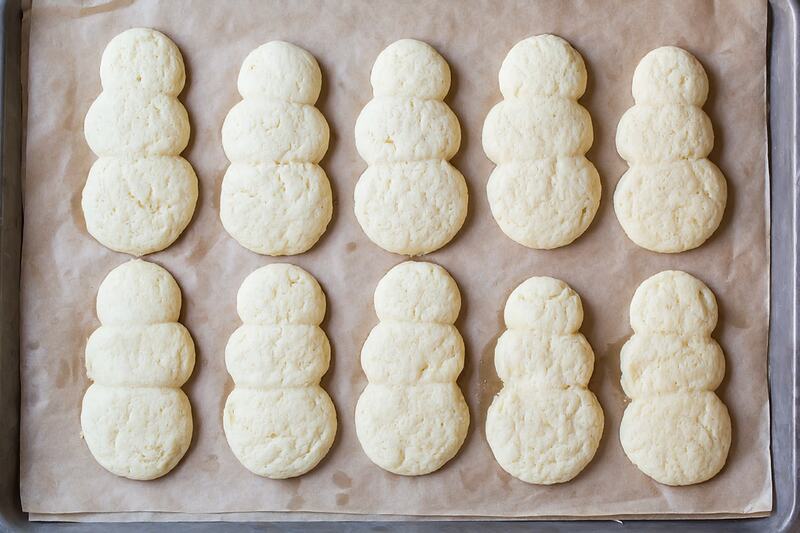 For each snowman, place 3 balls in decreasing sizes with edges just touching on prepared baking sheets spacing them about 3-inches apart. Flatten balls right between 1/2-inch and 1/4-inch. Bake in preheated oven until nearly set, about 10 - 12 minutes (they should not be doughy). Let cool on baking sheet about 5 minutes then transfer to a wire rack to cool (I like to transfer to an airtight container about halfway through cooling so they don't dry). Stick one pretzel stick in each side of cookies for arms. Repeat process with remaining dough. 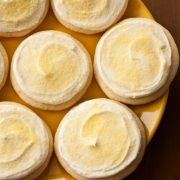 Once cool frost with vanilla frosting (I like to add a small amount of frosting to each round then spread outward with an offset spatula). For the frosting: in the bowl of an electric stand mixer fitted with the paddle attachment cream together butter, powdered sugar, half and half and vanilla until light and fluffy. Cut or tear a small piece of orange candy then roll and shape into a tiny carrot nose and add to cookies. Decorate with icing as desired. Add mini M&M's for buttons. Store cookies in an airtight container in a single layer. *To measure flour (don't fluff flour first) scoop measuring cup into container then level top with a butter knife. If you are in high humidity you made need to add a few extra tablespoons of flour so dough is manageable. **I transferred mine to piping bags with Wilton #3 tips to get a finer detail for the eyes then used a Wilton #46 tip for the scarves.